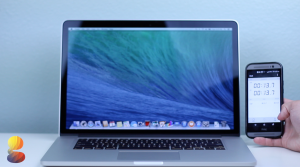 In this article we’ll be going over the speed and performance of the all new 15” mid 2014 MacBook Pro w / retina display. 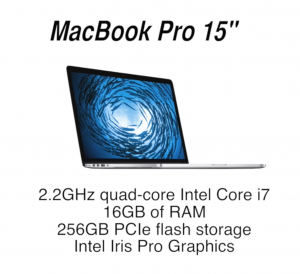 This specific model is the base 15 inch variant which means it includes a 2.2GHz quad-core Intel Core i7 processor, 16GBs of RAM, 256 GBS of flash storage, and intel iris pro graphics. The first thing we’ll be doing is testing the boot up time, and then we’ll be running Geekbench 3, cinebench, and the black magic disk speed test. Starting off with the boot up time you can see we get just under 14 seconds which is mostly due to the 256gb ssd. Next up is geekbench which is probably the most popular benchmarking tool when it comes to testing the CPU and memory of both computers and smart phones. Now GeekBench usually takes several minutes or so to compile a final score, so I’m going to speed this up. Now this 15” MacBook Pro scored 3398 single core and 13188 multi core. The numbers we get are essentially a compilation of a bunch of different categories GeekBench uses to test which ranges from stream performance, floating point performance, and integer performance. 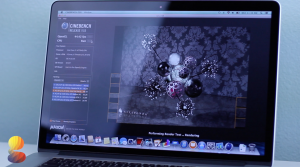 Our next test is cinebench which will test both the cpu and gpu. We receive an open gl score of 44.2 frames per second and we receive a cpu score of 6.49 points. The final test we’ll be doing is a disk speed test which tests the read and write speeds of the machine. Here we see the macbook pro scored 652 mb / s write speed and 727 mb /s read speed. Overall it seems like the 15 inch macbook pro is a solid upgrade from the previous gen model. I’ve been able to fly through video editing with this thing and it just delivers some seriously stellar performance. If you’re interested in purchasing one of these guys be sure to check out the link below. Also, If there’s any specific coverage you all would like to see feel free to leave a comment below, or if there’s something you really really want to see covered send me a tweet @gadgetguruhd since I’ll see your message over there no matter what.